A 16 & 47 storey tower standing tall at Peter & Adelaide. A modern statement in brick, concrete, metal and glass, it's a tall tower that still feels connected to the streets below. Throughout the building, you'll discover a wealth of communal spaces that are designed to make every moment matter. Taking inspirations from the neighbourhood, the design team created living spaces that are truly made in Toronto. Designed in the city, for the cit and located at the epicenter of culture and connection. Dream. If you're going to do it, do it big. This new condominium, is a pre-construction development project located at Entertainment District. It is said that a true artists finds inspiration in everything that surrounds him or her. Similarly, the neighbourhood around this high-rise tower is home to fascinating array of experiences that celebrate the art of exuberant living. Here, tantalizing stimuli for mind, body and spirit are just around the corner. This high-rise building is elegant and contemporary in design and finds a natural fit in the middle of the city where everything is happening, this is an address of convenience. A vibrant place that blends high-design, green spaces and outdoor living for every season. It has transit at every turn, culture, shopping, friends and family together into one dazzling hip happening neighbourhood. This luxurious residential building is brought to you by non-other than Graywood Developments, that will feature 1 residential tower at 16 & 47 storeys high. This shiny tall pillar will have podium levels that would house 4,403 square metres of retail space, including a 3,040 square metre grocery store with an entry area on the ground floor. Residential amenities would be located on the third floor of the podium, while suites are proposed for the upper podium floors. The tall storey tower standing at 47 storeys high will have a total of 695 residential units, 84 studio units, 493 one bedroom and one bedroom plus den units, 80 two bedroom and two bedroom plus-den units, and 40 three bedroom units. With a floor area of approximately 61,464 square metres, including 56,061 square metres of residential gross floor area. This location is in the Waterfront Communities - The Island neighbourhood in Toronto. This new building is close to all major amenities, major highways, hospitals, parks, grocery stores, and many retail shops. Very accessible TTC services are nearby such as the King streetcar which can take you east to the St Andrew Subway Station, or the Spadina streetcar which can take you north to the Spadina Subway Station. 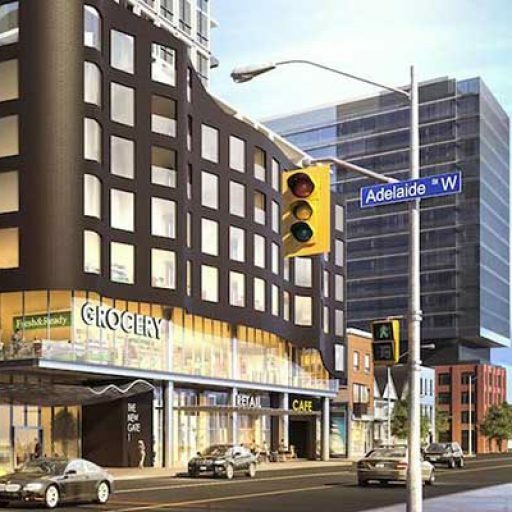 The neighbourhood will have hospital's near by such as Sick Kids Hospital, Princess Margaret Hospital and Mount Sinai Hospital to the northeast and Toronto West Hospital to the northwest. The closest parks to the development will include Grange Park and Alexandra Park. One of the biggest malls in the city will be within walking distance which is the Eaton Centre, a very popular destination for Torontonians and tourists. 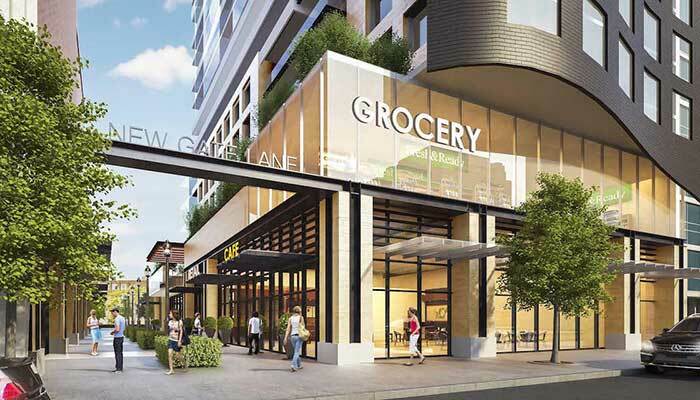 The grocery stores that will service the new condominium building area will include Rabba Fine Foods and Metro as well as many independent grocers. Private Schools & Montessori Schools are also near by the mixed-used real estate project. The new development scored a perfect 100/100 WalkScore and 100/100 TransitScore which highlights the central location and just steps to everything that makes living in Downtown Core so desirable.